NetEnt has really gone all out with the Planet of the Apes slot. Not only does it feature the Hollywood blockbuster movie – it features two of them! Yes, you have Rise of the Planet of the Apes and Dawn of the Planet of the Apes. How this works out in the game is that half the screen is for Rise, half the screen is for Dawn, so it’s a bit like playing two 5 reel 20 payline games at once, while only paying for the price of one. There are also a couple of awesome bonus features, and if you’re ready for some monkey action, then head over to one of these trusted casinos. Although the Planet of the Apes slot may look a bit overwhelming at first, it’s actually super easy to get started. In terms of setting your bet, it’s set up like any other slot. Set your coin value, which goes from £0.01 to £1, and then the number of coins you want to bet per line, which ranges from 1 to 10. Although both sides of the game have 20 paylines each, which really adds up to 40 paylines, you only pay for 20 paylines. This means that the minimum bet per spin is £0.20. Maximum bet goes to a hefty £200 per spin. Additionally, there is a bonus symbol on each side. The fixed jackpot to the Planet of the Apes can be won by spinning 5 scatters (the movie poster). This will land you 1,000x your bet level. So if you have a bet level of 2, that’s already 2,000 coins. And of course, if you get extra lucky and have wins on both sides, that’s 2,000x your bet level on just one side! Other than its unusual layout, Planet of the Apes has some bonus features that will get your adrenaline pumping. Dual feature: Before every spin, there’s a possibility that the Dual feature is active. When this feature is on, one symbols is chosen for Rise, and another for Dawn. If they land on their respective sides with the spin, they become sticky, and if the symbol lands on the other side, it will automatically move towards the side it belongs to. Rise Bonus: If the Rise bonus symbol lands on the first reel, then you’ll get an additional coin win for every human and ape symbol, excluding the Scatter. Dawn Bonus: If the Dawn bonus symbol lands on the last reel, then all the human and ape symbols will transform into the same symbol, greatly increasing your chances for a win. Stacked Wild: When you get a stack of Wilds in the Rise area, it will automatically duplicate itself in the Dawn area. Rise Free Spins: Get 3 Scatter symbols (the movie poster) anywhere in the Rise area and you’ll trigger 10 free spins. Any Wilds you get during these spins will be collected, and on the last spin they’ll all be placed randomly on the reels. Dawn Free Spins: 3 Scatters anywhere in the Dawn area will get you 15 free spins. During these spins, there will be 3 extra symbols for a Multiplier, Extra Wild, and Extra Free Spins. When these symbols land on the reels, they will be collected to fill up the meter. Once the meter is full, their corresponding feature will be activated. NetEnt has partnered up with 20th Century Fox, so the graphics here are absolutely authentic from the movies. It’s truly cinematic, with video sequences of apocalyptic mayhem taking over your screen when some of the bonus features are activated. The soundtrack is just as epic and you’ll be enthralled with the multimedia experience in the Planet of the Apes slot. 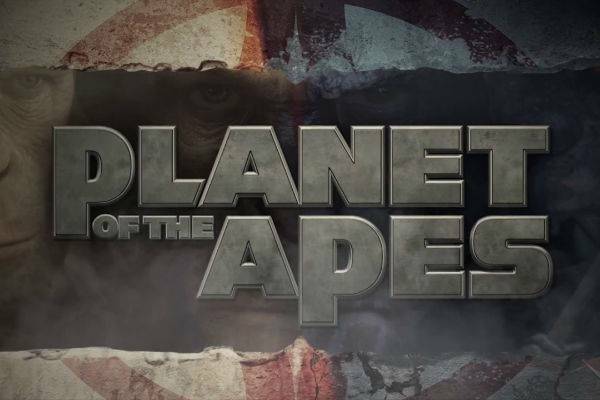 The Planet of the Apes movies were simply awesome, and Netent has now combine two of them into one slot. The game sports a more unusual format, with Rise of the Planet of the Apes on one side, and the Dawn of the Planet of the Apes on the other. It feels like playing two games with just one spin. There are also plenty of bonus features to boot, so it’s no surprise that this has become one of the most popular slots in the past year. Get into some ape action yourself at one of our recommended slot sites.